The automated fingerprint identification system market size is estimated to reach USD 8.49 Billion by 2020, at an estimated CAGR of 21.0% between 2015 and 2020. The automated fingerprint identification system is the biometric identification technique which obtains, stores, and analyzes the fingerprint data using digital imaging technology. The report aims at estimating the market size and future growth potential of the market across different segments such as components, search types, applications, and regions. The base year considered for the study is 2014, and the market size is estimated for the period 2015–2020. With the rise in use of identification systems, AFIS is expected to play a key role in fueling the growth of the market in the next five years. The automated fingerprint identification system ecosystem comprises stakeholders such as the electronic hardware suppliers, mobile application developers, research organizations, and the technology standards organizations, alliances, forums among others. The automated fingerprint identification system (AFIS) market size is expected to grow from USD 3.28 Billion in 2015 to USD 8.49 Billion by 2020, at a CAGR of 21.0% between 2015 and 2020. The increasing implementation of AFIS as the secure identification system is creating a huge demand for automated fingerprint identification system solutions across the world. The major factors driving the automated fingerprint identification system market are the transformation and technology evolution from manual process to digital process and the need for secure transaction. Furthermore, due to rise in the demand for integrated automated fingerprint identification system solutions and increasing adoption of mobile payment solutions, the market finds huge opportunity to flourish in the next five years. In this report, the automated fingerprint identification system market is segmented on the basis of component, search type, application, and region. The AFIS market for software is expected to have the largest market share and is likely to dominate the market between 2015 and 2020because of the growing demand for integrated AFIS products. The government and transportation sectors are expected to play a key role in changing the automated fingerprint identification system landscape and would grow at the highest rate during the forecast period. Automated fingerprint identification systems for tenprint searches are expected to dominate the AFIS market and to hold the largest market share, whereas latent print searches would grow at a steady rate during the forecast period from 2015-2020. The use of tenprint searches in the sectors such as hospitality, healthcare, and transportation is fueling the growth of the tenprint search AFIS market. The automated fingerprint identification system solutions are being increasingly adopted in other verticals, such as the banking and finance, which have led to the growth of the market across the globe. The AFIS market for the hospitality and government sectors is estimated to witness high growth during the forecast period. North America is expected to hold the largest market share and dominate the automated fingerprint identification system market between 2015 and 2020because of the presence of large number of biometric vendors. APAC offers potential growth opportunities as there is rise in adoption among enterprises and law enforcement agencies that are turning towards automated fingerprint identification system solutions to secure against potential threats. The market, however, is restrained to grow as the devices are not compatible with each other. The data sharing and algorithmic performances have been a major drawback for the market to pick up. These technical challenges of interoperability need to be addressed to ensure the continual growth of the AFIS market. 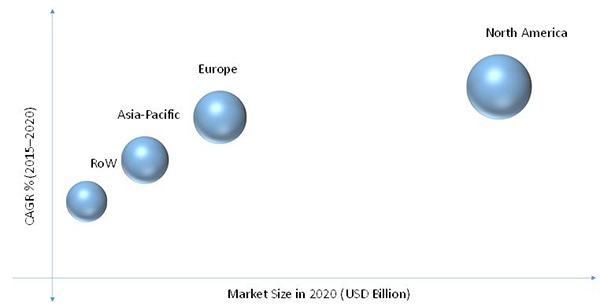 The major vendors in the automated fingerprint identification system market include 3M Cogent Inc. (U.S.), Morpho SA (France), NEC Corporation (Japan), Fujitsu Ltd. (Japan), Crossmatch Technologies Ltd. (U.S.), HID Global Corporation (U.S.), M2SYS Technology (U.S.), East Shore Technologies (U.S.), AFIX Technologies Inc. (U.S., Papillon Systems (Russia), Sonda Technologies Ltd. (Russia), Dermalog Identification Systems GmbH (Germany), and Suprema Incorporation (South Korea). These players adopted various strategies such as new product developments, collaborations, partnerships, and expansions to cater to the needs of the market.